​Nellie Holmes is a singer/ songwriter from Eastern Ontario. Her lovely voice, haunting lyrics and her energy is the driving force behind The Pie Plates. Many of the songs that The Pie Plates perform are written by Nellie. She has been playing in bands for the past 12 years but has sung and played guitar since her teens. Nellie has released one CD of original material - "Dancing in the Kitchen" and has released a CD with The Pie Plates - "Another Slice Please". Rick Hare is a seasoned mandolin and guitar player. He has played music for over 20 years. Rick's attention to detail and his dedication to rehearsing is evident in his performances. He is always willing to help out and is a real asset to The Pie Plates. 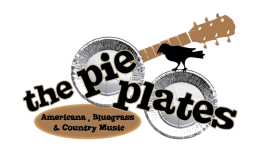 Rick is happy to be a part of The Pie Plates and during the summers he will be found at the Bluegrass Festivals jamming with friends and helping to teach new mandolin players. Gary Barr is a relative newcomer to bluegrass. Gary has enjoyed years of playing country electric bass and looks forward to contributing to The Pie Plates with "timing, tone and above all.....feel" with stand up bass. He is a talented artist and musician. Gary is also a very seasoned guitar player and enjoys singing and working on harmonies. He is a great fit with The Pie Plates and has an excellent work ethic. Ray Desjardins is one of the best fiddle players in Eastern Ontario. He has been playing the fiddle for over 35 years. His openness to different genres of music has allowed him to become a very versatile musician. For the past 10 years Ray has been playing bluegrass music with several bands and has played in many festivals in Ontario and New York State. His energy and enthusiasm create a great synergy on stage. He is joy to play music with and keeps us all smiling. ​Garry Greenland is an accomplished and highly respected bluegrass Teacher/Musician. For over 30 years he has performed and taught Scruggs style banjo, mandolin, guitar, and "band" classes. Garry has taught dozens of players who have gone on to be successful band members. The Pie Plates are honoured to have Garry share his extraordinary talents and are happy he will be playing banjo with us.